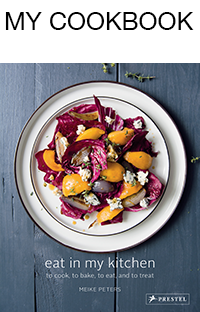 There are two ways to enjoy this recipe: if the weather is nice and sunny, take out the barbecue and make it an outdoor treat, in case summer shows its grey and rainy face, just turn on the oven. 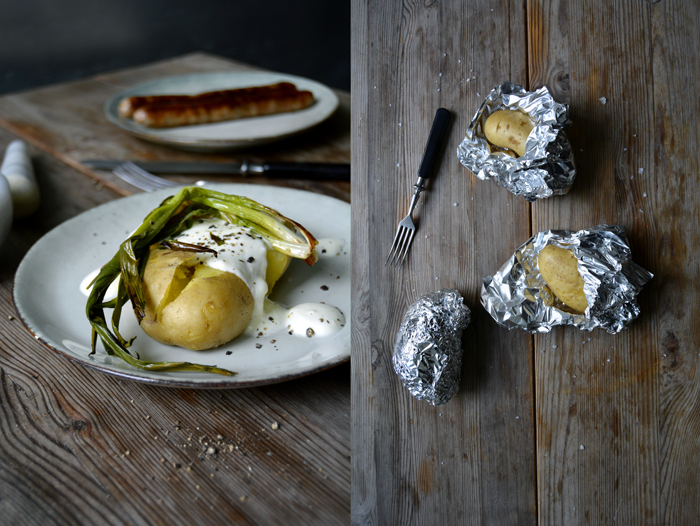 Either way, I would always pre-cook the potatoes before you wrap and bake them in foil but I must confess that I’m an impatient soul, it’s up to you. I’ve waited hours at BBQ’s for the potatoes to be done, to avoid stretching my hunger unbearably I started to cook them beforehand until they are almost done. It’s a bit sneaky, I know, but it tastes just as good. 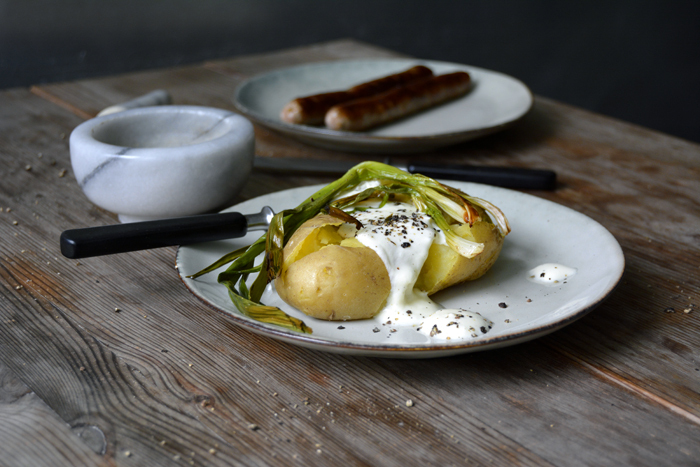 This combination is a classic on the grill: potatoes, onions, sausages and a creamy dip. 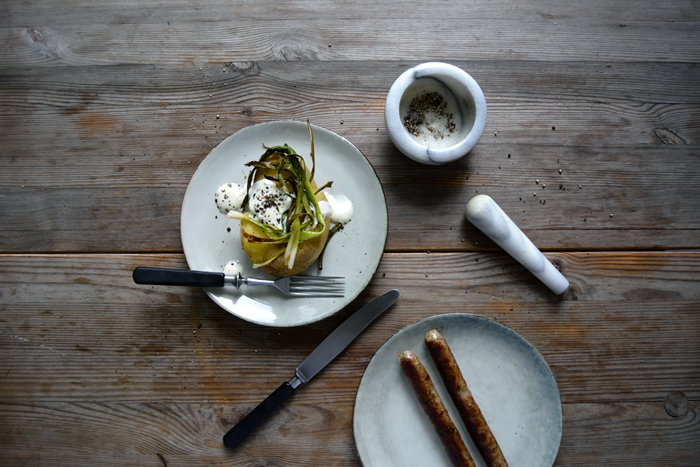 I smashed the sweet and soft root with my hand and topped it with one of the most delicious (and simple) dips I’ve eaten this spring, it’s just sour cream whipped with olive oil, crushed spring garlic, salt and pepper, it’s divine! It feels like a hint of mayonnaise which goes so well with potatoes but without its eggy heaviness. 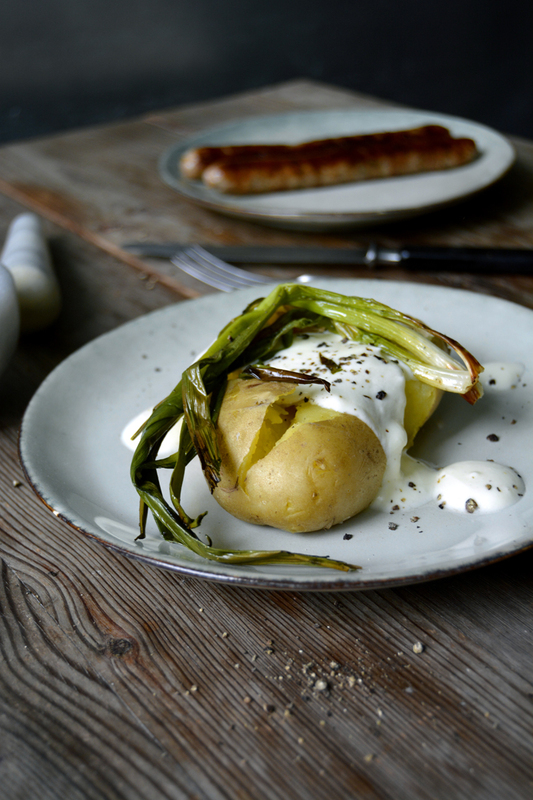 The roasted spring onions add a complementary spiciness and the German sausages are a BBQ must for me. I love my glass of wine for dinner but beer is the right choice in this case! Whisk the ingredients for the dip and season to taste. Cook the potatoes in salted water until almost done, rinse with cold water and let them dry for a few minutes. Wrap in aluminium foil with a little sea salt and prick with a fork. Coat the spring onions with the olive oil. Set the oven to 220°C / 430°F (top / bottom). 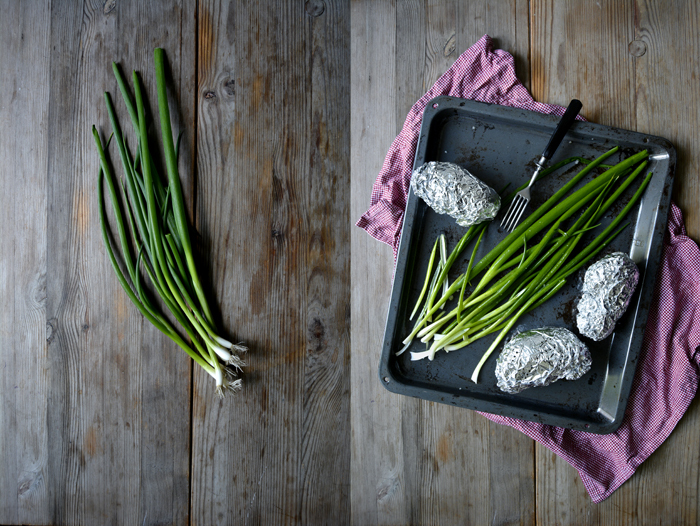 Spread the spring onions and the wrapped potatoes on a baking sheet, sprinkle the onions with salt and pepper and roast for about 15 minutes or until golden brown and crisp at the ends and the potatoes are soft (check with a fork). Turn the onions once while roasting. 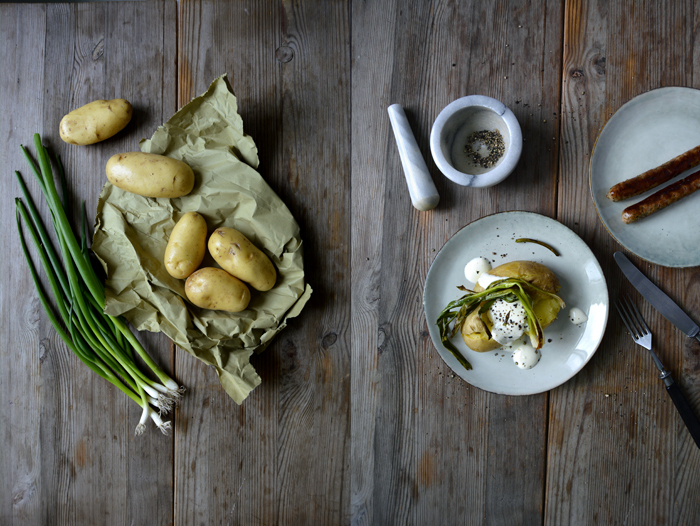 Unwrap the potatoes, smash them on the plates with your hand, top with a dollop of the dip, the roasted onions and a little more pepper. Lay the wrapped potatoes close to the coal for a few minutes until soft, mind that they don’t burn. Lay a piece of aluminium foil on top of the BBQ, prick the foil so that it has a few holes and spread the onions on top. Season with salt and pepper and grill until golden brown. Serve as described in the bad weather option.